BRISTOL, Conn. -- Floyd Mayweather responded to Conor McGregor's most recent demand of a $100 million purse for a boxing match with a counter offer: $15 million and a cut of the pay-per-view. Mayweather, the retired boxing champion who turns 40 in February, was a guest Wednesday on ESPN's First Take and challenged both McGregor and the UFC to close the deal. "You guys keep hearing all these different rumors about different fighters want to face Floyd Mayweather," he said. "Everybody keeps talking about Conor McGregor. He's blowing smoke up everybody's a--. Dana White, the UFC -- let's make it happen. Bring him over to the boxing world, and I'll show him what it's like." McGregor, 28, the UFC's lightweight champion, isn't expected to return to the Octagon until at least May while taking a break for the birth of his first child. While talk of a Mayweather-McGregor boxing match dominated social media headlines for much of 2016, McGregor took things one step further in December when he obtained a license to box professionally in California. Mayweather, who retired unbeaten at 49-0 after his September 2015 win over Andre Berto, cited the importance of his health in reiterating that he won't consider the fight unless he can make nine figures. "We tried to make the Conor McGregor fight," Mayweather said. "They know what my number is. My number is a guaranteed $100 million. That was my number. "We are willing to give him $15 million and then we can talk about splitting the percentage -- the back end -- on the pay-per-view. But of course, we're the 'A side.' How can a guy talk about making 20 or 30 million if he has never made 8 or 9 million in a fight." McGregor holds the UFC record for the richest disclosed purse when he made $3 million (not counting pay-per-view bonuses) for his UFC 202 victory in August over Nate Diaz in their rematch. His UFC 205 purse from his victory over Eddie Alvarez, becoming the first UFC fighter to hold titles in separate weight classes simultaneously, remains undisclosed. Ronda Rousey equaled McGregor's UFC mark of $3 million for her Dec. 30 loss to Amanda Nunes at UFC 207. Mayweather talked of how comfortable he is in retirement, spending much of his focus on his promotional company. But despite making upwards of $300 million for his 2015 victory over Manny Pacquiao, Mayweather say he isn't interested in a rematch. "Only thing I'm probably interested in is the Conor McGregor fight," Mayweather said. "I'm a businessman, and it makes business sense. I believe in what me and [adviser] Al Haymon talk about every day -- I believe in working smarter, not harder." Asked what a boxing match against McGregor would look like inside the ring from a competitive standpoint, Mayweather interrupted to say, "What's understood doesn't have to be talked about." 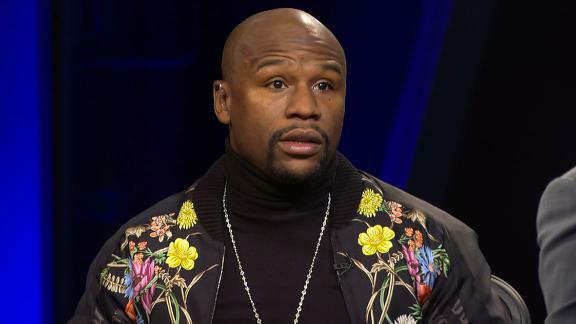 Floyd Mayweather joins First Take to detail the contractual terms he would need in order to agree to box UFC champion Conor McGregor, as well as why he is only interested in fighting McGregor and not Manny Pacquiao.